John Downie is a well-known very ornamental crab apple. Popular for a combination of reasons. This tree carries a combination of large quantities of cup shaped, white flowers which open from pale pink coloured buds in late spring, followed by large, orange/red coloured almost pear shaped fruit, which are edible and may be used in making preserves. In addition, this apple often acts as a pollination partner for many of our apple fruit trees. For best results plant in a full sun position. Like our other crab apples varieties, John Downie makes an excellent choice for a small to medium sized town garden even though it is considered fast growing. Expect visits from Wildlife to increase e.g. birds and insects but no lions and tigers unless you leave near a poorly fenced zoo and you are making beef jerky in the garden. John Downie is a good choice for also making cider when mixing the juice with other apple varieties. Our John Downie is supplied at 2-3 years old and a crop of crab apples in the first year is a realistic expectation but not guaranteed. It has received the RHS Award Of Harden Merit meaning that it has particularly outstanding attributes when compared to other Crab Apple trees which could be a little controversial when you read about its disease resistance in a bit. Expect a height of around 4m and width 2m at 10 years as the John Downie crab apple tree is usually grafted onto a MM106 rootstock. The final height is determined by local conditions and soil types so if you are planting in "Blue Peter soil" or emulate Monty Don or any other TV gardening personality, then you are likely to get favourable results quickly. Should your local weather promote penguin population growth more than crab apple growth then expect to wait longer. Support UKIP in banning all non British Bacteria and Fungus from our shores. This tree will benefit from an occasional pruning to thin out the branches to promote new growth. Mid Summer on a hot day is one way of reducing infection to an open tree wound, other experts would suggest anytime in its dormant phase from November to March. 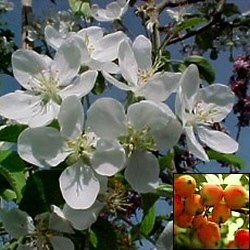 This crab apple tree is listed as clay tolerant and will perform well in most fertile well draining soils from acid to alkaline. Listed as group 4 meaning it will pollinate other apple trees in group 3,4 or 5. This tree is listed as self fertile and therefore will produce a crop of apples if not other apple tree or pollinator is nearby. Entirely possible that you get a crop of crab apples in the first growing season. Considered to be fully UK hardy and capable of surviving a "normal" UK winter and frost. M27 : Mature height will be around 150-200cm, Supplied at around this height. The "Half Standard" part of the rootstock options refers to the tree shape. It has been pruned to give a pleasing ornamental lollipop shape and has a section of clear stem. These will be trees and not bushes or shrubs. This tree is supplied at of height of between 1.5m and 2.4m in a 10-15 litre container, which means that the tree can be planted any time of the year and with better results than either bare-root or rootballed trees.